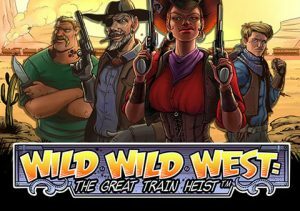 Join a gang of cowboy brigands for some railroad larceny in Wild Wild West: The Great Train Heist, a 5 reel, 10 payline video slot from Scandi developer Net Entertainment. This trip to the American frontier comes with a pick me bonus where prizes of up to 50 times your stake can be won. Also on offer are up to 60 free spins, complete with 4 special wild modifiers. Grab your holster and gun from between 10p and £100 per spin. By the way, this game is exclusive to Mr Smith Casino and Betsafe Casino (who are part of the Betsson group). The visuals on show in Wild Wild West: The Great Train Heist are very well done – reminiscent of a comic book retelling of a classic western movie, reels feature lower value playing card suit symbols alongside a quartet of sharp-shooting desperadoes. The gun-toting gal is the most rewarding symbol, awarding 500 coins if you land 5 on a payline. There’s also a standard wild which also pays out up to 500 coins as well as replacing all other symbols bar the 2 bonus scatters. First, we’ll look at the Pick and Click feature which is triggered by landing the safe symbol on the odd numbered reels (1, 3 and 5). You then get to choose 1 of the safes and in the process collect a payout of between 5 and 50 times your stake. The game also comes with a Free Spins feature which is triggered by landing the 7 symbol – 3, 4 or 5 of these anywhere on the reels will get you 10, 20 or 30 free spins. Also on offer are a series of wild modifier extras which are decided by spinning the Wild Selector Wheel. The goodies on offer are a standard wild, an expanding wild which fills the reel in which it hits, a spreading wild and a multiplier wild which doubles every payout in which it appears. An overlay wild (which is same as the modifier wild you hit from the reel spin) will land at random on reels 1, 2 or 3 during each free spin. You can also get up to 30 additional free spins if you get 3 or more scatters during the feature – you will be taken back to the Wild Selector Wheel to determine a new wild feature. The design of Wild Wild West: The Great Train Heist is excellent. The imagery is superbly well drawn (think Jack Hammer from the same developer) with the action playing out to a chugging soundtrack that’s part Johnny Cash, part Sergio Leone. The Pick and Click feature isn’t the most exciting you’ll come across but can still deliver some decent rewards. Likewise, the free spins where the wild extras can help things along is where the bigger wins of up to 500 times your stake can be won. The variance here is in the middle so you should get plenty of play for your investment. There’s plenty of enjoyment to be had playing Wild Wild West: The Great Train Heist. It’s great to look at, sounds terrific and comes with a pair of feature rounds that hit at pretty regular intervals. Cowboy films have largely gone out of fashion among movie goers. If you like the theme, NetEnt also offer you the superb Dead or Alive which is highly volatile and a cult favourite.